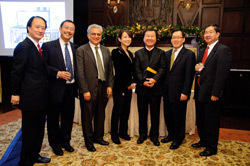 The Asian American Federation hosted a holiday reception on Tuesday, December 7, 2010 at the Harvard Club to thank supporters, in-kind donors, and board directors. 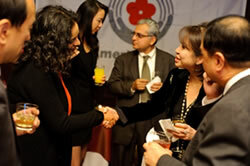 Executive Directors Steven Choi of MinKwon Center for Community Action; Seema Agnani of Chhaya CDC; and Grace Yoon of Korean American Family Services Center, each gave testimonies on what their agencies do, what their challenges and needs are, and how the Federation has helped support their own communities as well as the Asian American community at large especially though the recent economic crisis. The Federation graciously appreciates all of its supporters, friends and partners for their generous gifts and continuous support over the years.